Our two preschool programs provide the tools and stimulation to help your child grow and learn in an environment that focuses on the development of the whole child. All programs provide continuous opportunities for social, emotional, cognitive and physical development. NPD Preschool Academy emphasizes play with a purpose where teachers create an environment that fosters curiosity and facilitates learning. Through this guided play, the children develop kindergarten readiness skills. Our program is centered on hands-on learning experiences with the foundation based on the Illinois Early Learning Standards and Objectives. The curriculum includes music, science, art, math, literacy, large and small muscle activities, and learning games. Our program’s focus is on individual growth, self-esteem, problem-solving and social interaction. Located at our Interpretive Center at Seager Park and at our Knoch Knolls Nature Center, Toadstools & Pollywogs takes advantage of the vast acres of land with nearby walking trails, open fields, pond, river and an abundance of wildlife which provides endless opportunities for our preschoolers to explore and investigate. Toadstools and Pollywogs emphasizes play with a purpose where teachers use the natural environment to foster curiosity and facilitate learning. Through this guided play, the children develop kindergarten readiness skills. Our program is centered on hands-on learning experiences with the foundation based on the Illinois Early Learning Standards and Objectives. The curriculum includes music, science, art, math, literacy, large and small muscle activities, and learning games. Our program’s focus is on individual growth, self-esteem, problem solving and social interaction. Children must have a current medical form on file with the Park District and must be fully toilet trained (no Pull-Ups® allowed except in the Two’s Plus and Young Threes) except in our Twos Plus classes. Children must be able to separate from parents or caregiver in a timely manner and must be able to communicate their basic needs and follow simple directions. This class is designed to make your child’s first preschool experience a calm and comfortable one. The program focuses on separation and building trusting relationships between child and teacher and teacher and parent. Your child is exposed to a variety of activities and experiences that encourage social awareness and cognitive development in a gentle, nurturing and playful environment. This program focuses on creating a warm and nurturing environment where children are encouraged to explore and interact with one another. Children are introduced to key early childhood basic skills and concepts though play and hands-on experiences. This program is a three-year-old preschool class designed for children who are ready for an additional day of preschool. The program focuses on creating a warm and nurturing environment where children are encouraged to explore and interact with one another. Children are introduced to key early childhood basic skills and concepts though play and hands-on experiences. Our four-year-old program is a continuation of our three-year-old preschool program. Children continue to work on developing their social skills while building their foundation of learning. Children continue to develop their early literacy, math, science and social study skills through hands-on learning experiences. This program is an extension of our four-year-old program. It is designed for children who are ready to attend preschool for an additional day. Our four-year-old program is a continuation of our three-year-old preschool program. Children continue to work on developing their social skills while building their foundation of learning. Children continue to develop their early literacy, math, science and social study skills through hands-on learning experiences. Do you have questions about the Park District’s preschool program? Our Preschool Information Nights answer all of your preschool -related questions! Thursday, January 10: Preschool Information Night at Knoch Knolls Nature Center, 6:00-7:00 p.m.
Thursday, January 17: Preschool Information Night at Alfred Rubin Riverwalk Community Center, 6:00-7:00 p.m. Please visit our preschool blog at www.npdpreschool.blogspot.com. • There is a $75 nonrefundable registration fee. 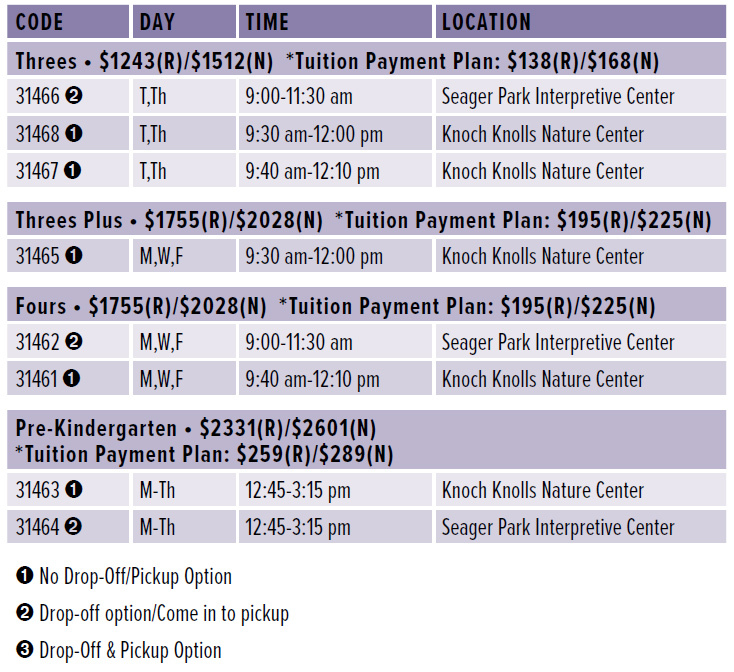 • Two options are available for preschool payments. Parents may pay for the program in full at the time of registration or enroll in an automatic payment plan through use of a credit/debit card or checking account. 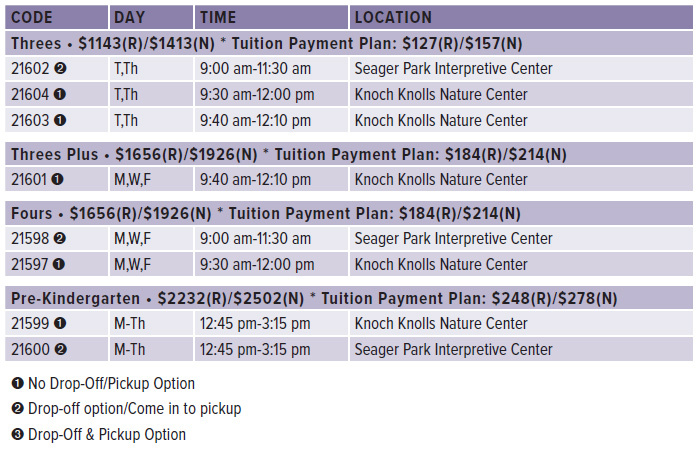 If enrolling in the automatic payment plan, the first tuition payment is due at the time of registration. • If your child is a new student, a copy of their birth certificate is required. Please note that you will not be allowed to register without a copy of your child’s birth certificate. • Preschool spots are available on a first come, first served basis. • Once your child has been registered for a preschool program, you may not waitlist that child for another preschool program. • Please note that your child must be 30 months, 3, or 4 by September 1. No exceptions will be made. You must register in person at a Naperville Park District registration office. Online, phone registration or mailed forms will not be accepted. 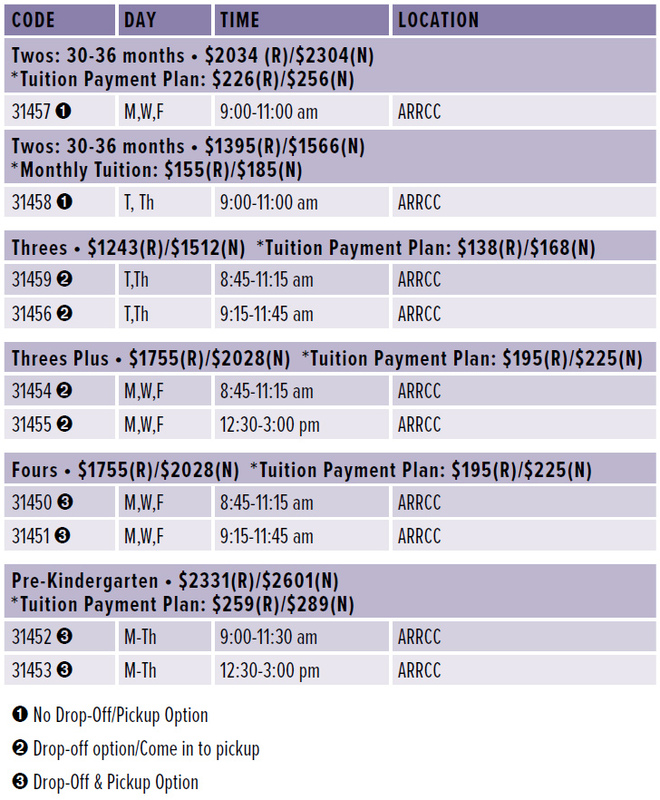 Two options are available for preschool payments. Pay the full program fee at the time of registration. Pay the first tuition payment at the time of registration and enroll in the automatic payment plan where an additional eight equal tuition payments will be withdrawn from your checking account or charged to a credit/debit card. 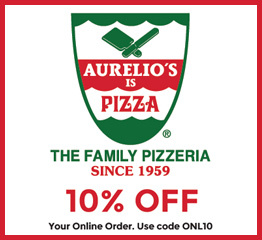 These payments will occur on the first of each month beginning September 15 through April 15. Credit/debit cards that are declined will be charged a $25 service fee by the Naperville Park District and may result in the forfeiture of this payment option. Enrolling in preschool is a commitment that your child will attend for the entire preschool year. However, we do understand that situations arise that require a withdrawal from the program. 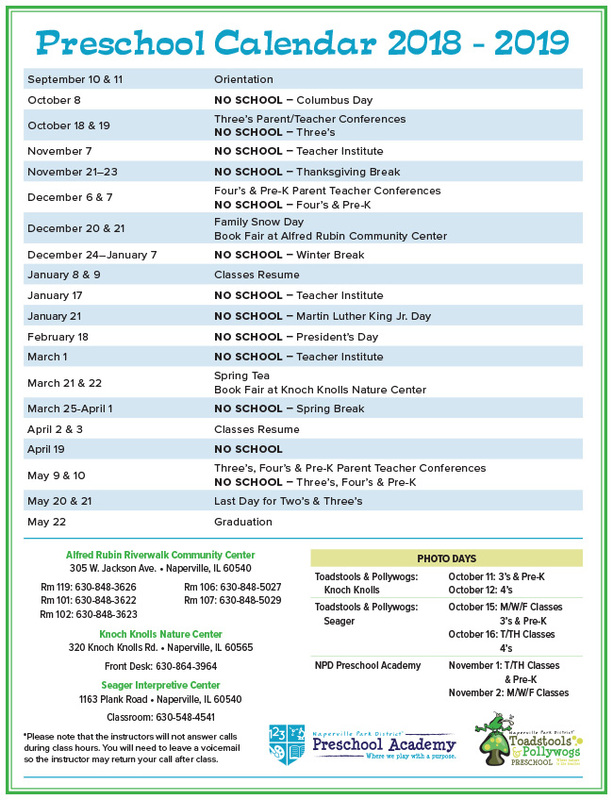 The Naperville Park District must receive requests to withdraw from the 2019-2020 preschool program by July 25, 2019 in order for you to receive a refund of your first tuition payment. First tuition payment refunds will not be issued after this date. 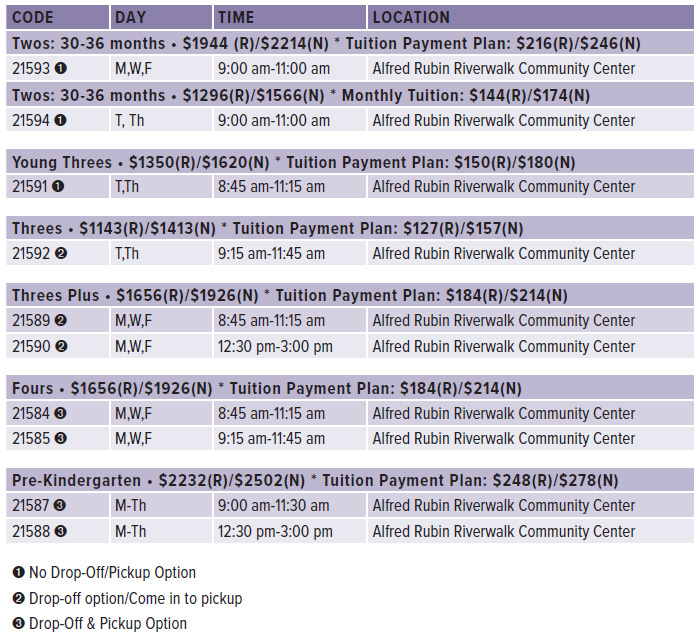 The first tuition payment is nonrefundable for preschool program registrations received after July 25. Program withdrawal requests received after the start of preschool must be received two weeks before your child’s last day in order to receive a refund of tuition paid for days that your child will not attend due to withdrawing from the program. Program withdrawal requests will be accepted October 1, 2019 through March 1, 2020. Refunds will not be issued for program withdrawal requests received after March 1. Please contact the Program Manager at (630)848-3571 if you need to cancel your child’s preschool enrollment. January 10: Preschool Information Night at Knoch Knolls Nature Center, 6:00-7:00 p.m.
January 17: Preschool Information Night at Alfred Rubin Riverwalk Community Center, 6:00-7:00 p.m.
All children currently enrolled in the 2018-19 preschool program or alumni families will receive priority registration for the 2019-20 school year. 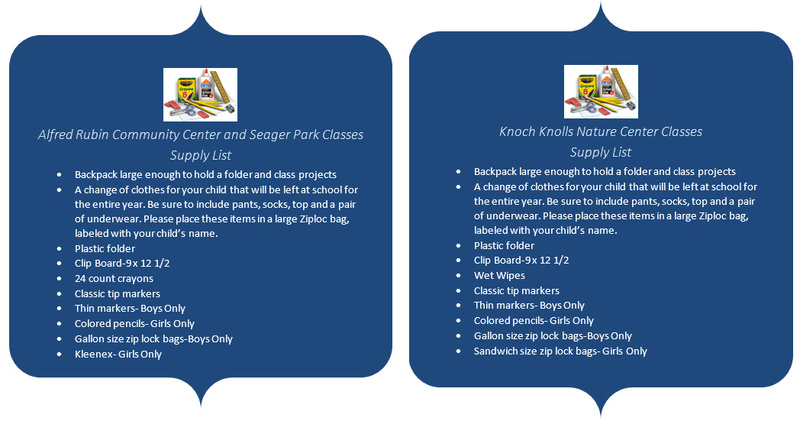 An informational packet will be sent home in your child’s backpack the beginning of January. You will receive a welcome letter at the end of August that will include your child’s teachers and orientation time. You will need to complete the following: Physical Form, Child’s Information Card and Getting Acquainted Form and bring them to orientation. The forms were provided in your blue folder that you received when you registered. They also are available on our website, napervilleparks.org. Preschool forms will not be accepted before orientation. All paperwork must be complete before your child will be allowed to start preschool. Orientation is an opportunity for you and your child to visit your child’s classroom and meet his/her teacher. Preschool Orientation will be on Monday, September 9, 2019 for Monday, Wednesday and Friday, and Monday-Thursday programs. For Tuesday and Thursday programs, orientation will be on Tuesday, September 10, 2019.